Umbrella companies offer a “hassle-free” business structure for contractors to operate under.The main purpose of the umbrella company is to handle all administration associated with contracting, primarily the invoicing, taxation and payroll aspects. An umbrella company is an intermediary between a contractor and the contractor’s clients. The contractor’s client pays the umbrella company. The umbrella company then take care of all of the tax deductions and transfer the remaining balance to the contractor. You work for your clients as normal. At the end of the week or month, you submit your hours and expenses to the umbrella company. 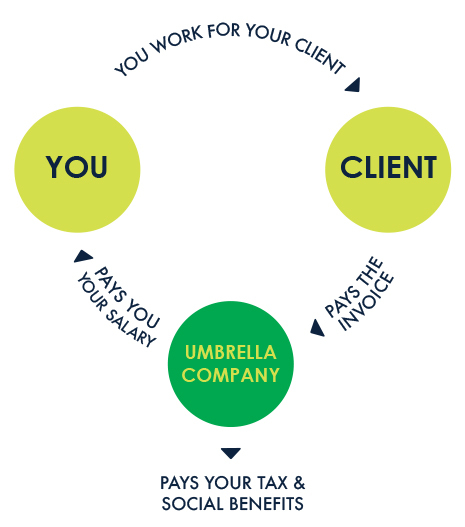 Your umbrella company will then take care of invoicing your client and collecting the payment. Lastly they will pay you your salary and expenses reimbursements and will pay the relevant income taxes, PAYE, PRSI and USC to the taxman for you. Umbrella companies tend to be used by individuals on short-term contracts in between permanent roles or by those long-term contractors who do not want the added workload of running their own Limited Company. Umbrella companies enable contractors to retain their employee status under the social welfare system. This means you can continue to pay Class A PRSI which entitle you to the same social welfare protections and benefits as ordinary employees. Working under an umbrella company gives you the same feel as being a normal employee of a company. You will receive weekly or monthly payslips, a P60 at the end of the year and a P45 when you finish contracting. Umbrella companies can also complete salary certificates when you need them for mortgage or loan applications. Fenero are Personal Tax Experts specialising in tax services to contractors, freelancers and landlords. If you need advice or assistance with income tax returns or tax solutions for contractors, get in touch!